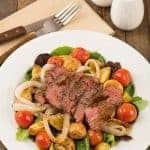 This warm potato salad uses sour cream to give it a creamy, smooth texture instead of mayonnaise. 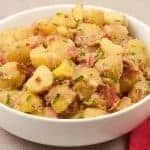 It has a fantastic lemon flavor, and since the rosemary and pancetta are more like “toppings” for this potato salad, feel free to use as much or as little of each as you like. 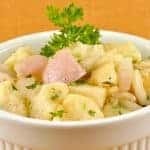 If a traditional mayonnaise-based potato salad is too rich for your taste, try this warm potato salad tossed with sour cream and lemon juice. Peel potatoes and cut into quarters or eighths (depending on how large they are). Bring a pot of salted water to a boil and cook potatoes for 10 to 15 minutes or until easily pierced with a knife. 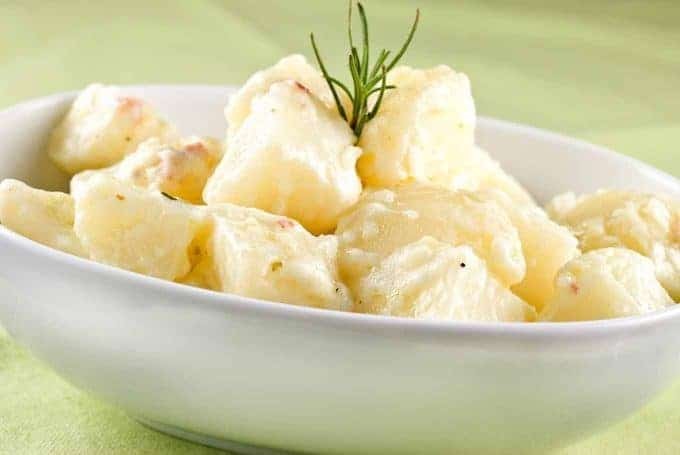 Drain potatoes, and while still hot, dress them with olive oil, lemon juice and salt and pepper to taste. Toss potatoes with chopped rosemary, pancetta and sour cream until well combined. If you want an extra bit of lemon flavor, toss in some fresh lemon zest, too. The potato salad is best served warm, but it’s pretty tasty right out of the fridge, as well. 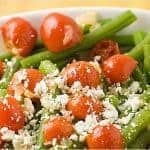 You can also substitute plain yogurt (preferably Greek-style) for the sour cream.